We are excited to have your family join our family. Swartz Creek Community Schools is a student-centered district that truly maximizes each learner’s potential so they become a productive participating member of society. This website will help answer any questions you may have regarding enrollment and residency. We are currently pre-registering kindergarten and early five's students for the 2019-2020 school year. Please click the link below to pre-register. 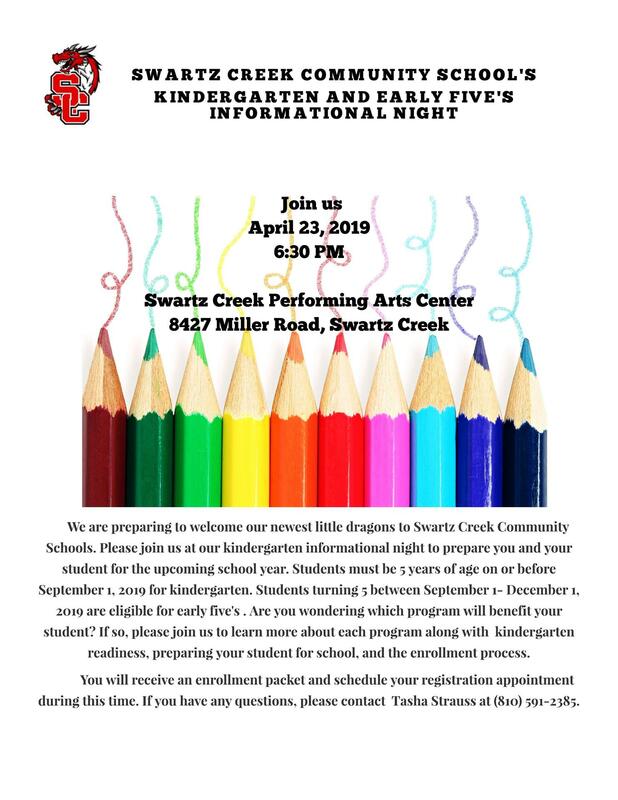 Enrollment packets will be available at our kindergarten and early five's informational night, Administration Building located at 8354 Cappy Lane, and each elementary building beginning April 24th. Swartz Creek Community Schools participate in the State of Michigan's 105 & 105C School of Choice Program. We also have an in-district elementary school of choice program. 1. Print out a student registration packet and registration dates. 2. Complete your packet and gather your support documentation. 3. Registration is held at the Swartz Creek Administration Building located at 8354 Cappy Lane. Registration is open 8:00 AM to 3:00 PM, Monday through Friday. Please call (810) 591-2385 if you have questions or need assistance with registration. Due to reporting requirements, students will not be allowed to start school until all documentation is on file. High school students- please bring a transcript from previous school and exit grades if enrolling during the school year.